Nice water flow images but is there any way possible to tell how long ago it did flow. The other think\g to note is the amount of water that would be required to make what we see. 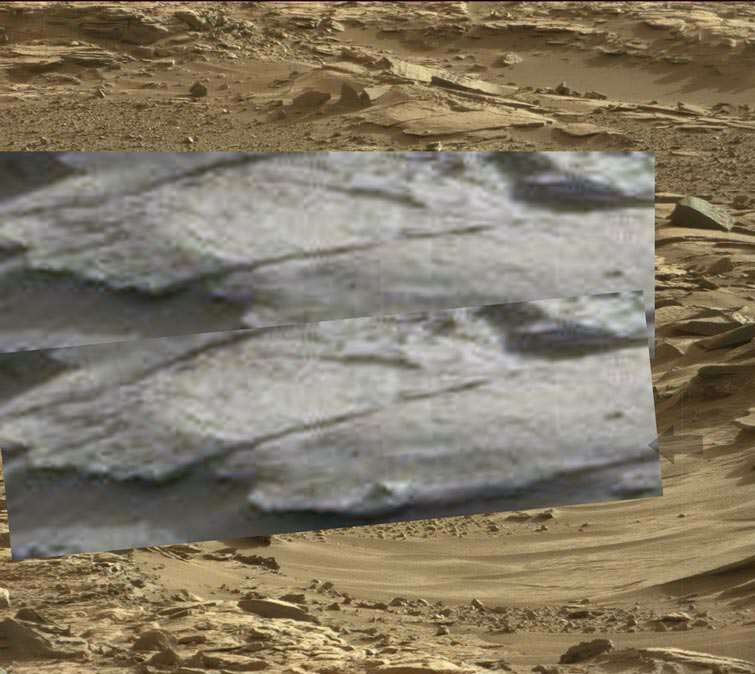 The second image posted in 499 shows just how much dust is in the air of mars. Thanks, and time period the rover landed 5 years ago, (more or less) with last Sol being 2172, or present day, and l am up to SOL, (SOL is one martian day) 590, or around 600, so about 4 years ago or the year 2014. And true, l believe that we would need constant light rainfull, or bursts of torrential rain to pull off what l am finding. 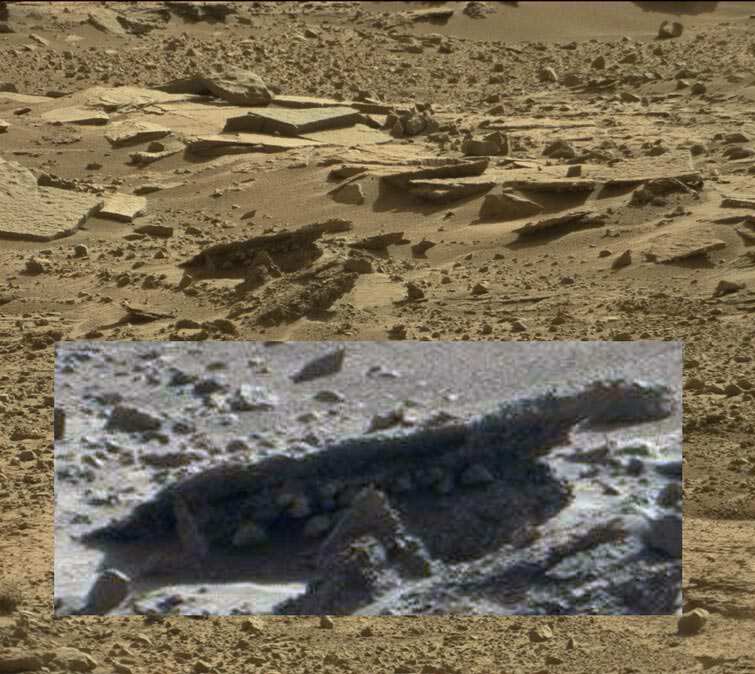 The rover in SOL 588, must have gone through a ten or 15 minute burst in order to produce the water flows on the landscape and making the surrounding soil, damp enough to cling to the rovers wheels for a good part of a week. 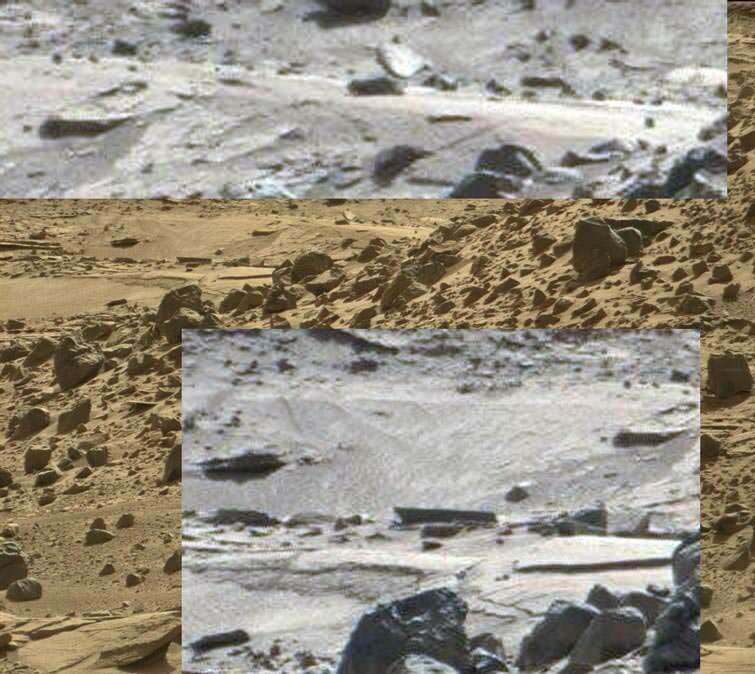 I know the second image looks dry and dusty, but that is NASA BS, or their universal filter that they put over virtually every image they give us. 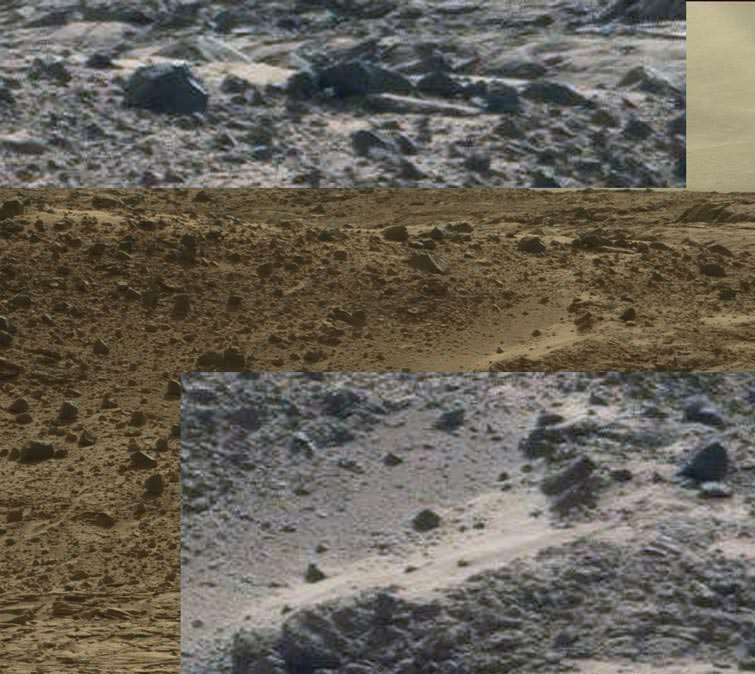 NASA landed Viking in 77, expecting nothing, and found the opposite then got spooked and red filtered the lot, and nobbled the oven experiment. 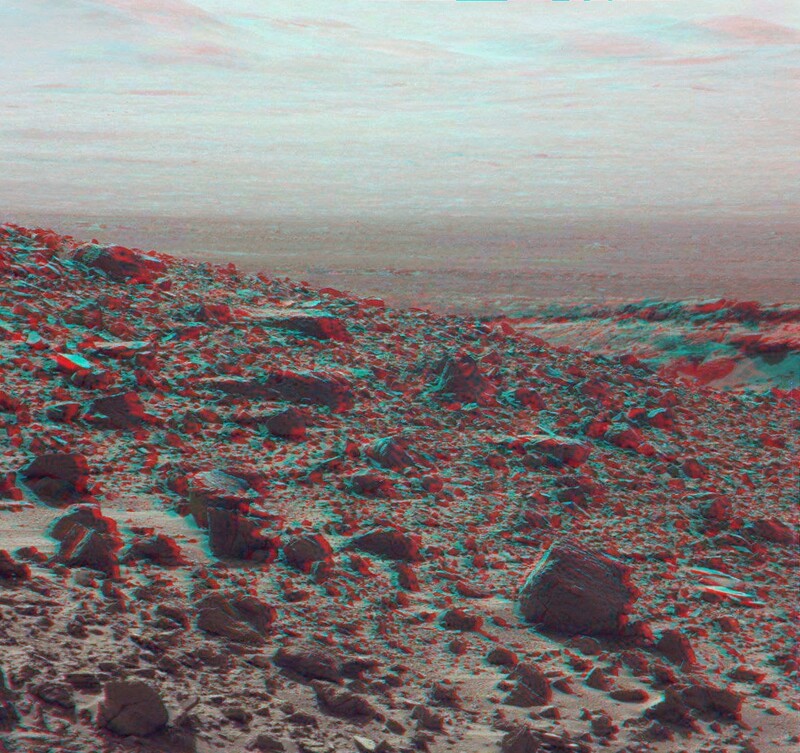 Initial tests in the soil and images where correct. 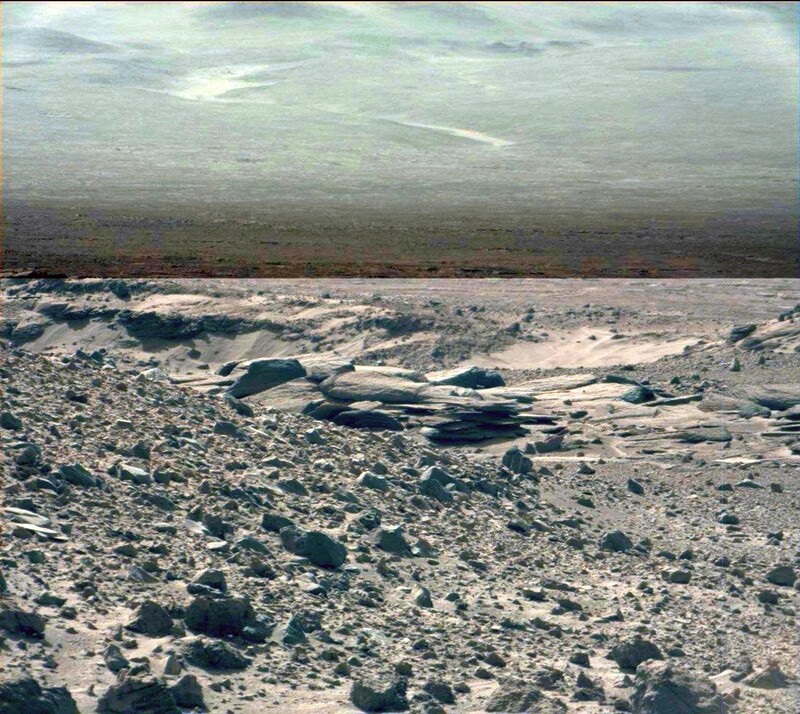 We had two probes in 1977, and without checking 78 land on Mars, and give us the same blue sky, green on the rocks images. 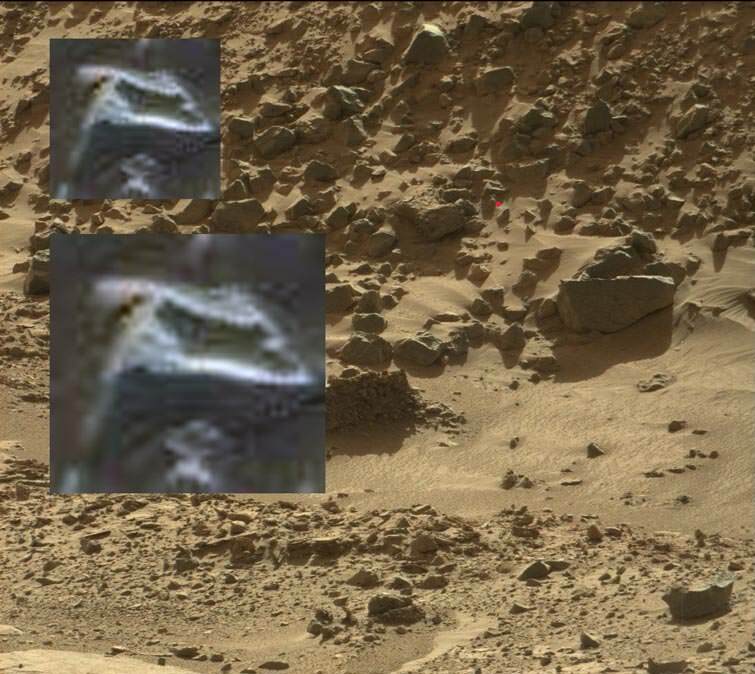 Then since then NASA red skied all images including later Viking ones, (pretty hard to send one probe to mars, mess up the colors, and then do it again a year later, especially when they costed a billion or more). NASA already knows Mars is Earthlike, and is trying to come clean, but do it in a not mass riot kind of way. 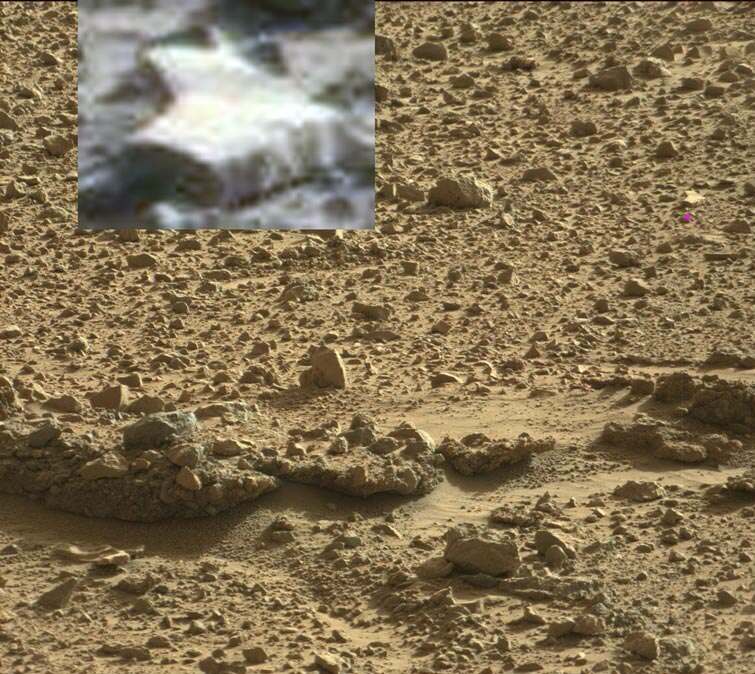 The water droplets and the perfect timing wet soil in SOL588, are saying that mars has rain, since there is literally no other explanation. Hard to comprehend, since we have grown up with NASA lies since childhood, but lies they are. Good lies perhaps to help stop mass panic, or from what l have witnessed elsewhere, help stave off mass psychoses, but either way full disclosure is inevitable. And looking forward to that day, is an understatement, in more ways than one. 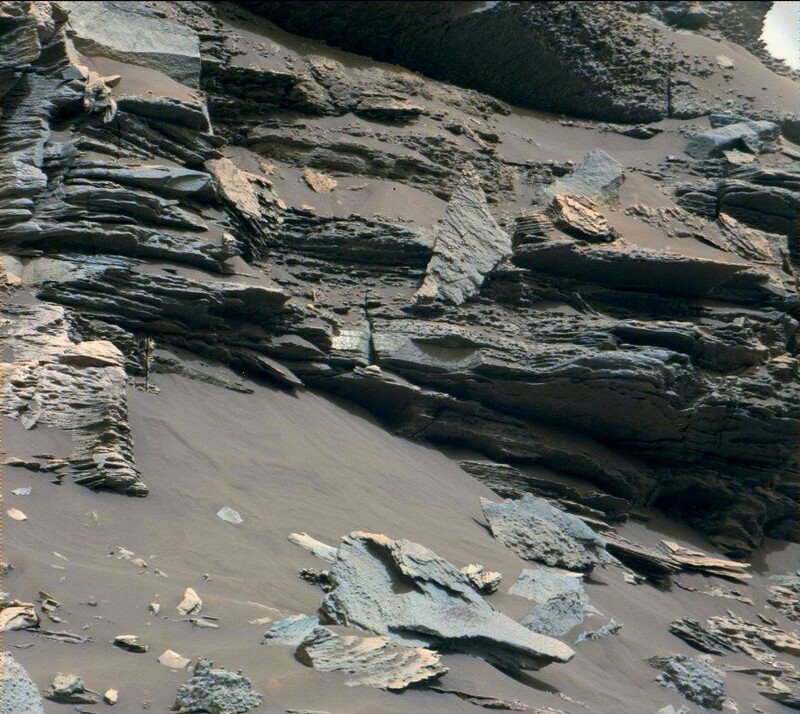 Sooner we get there to check out these weird formations, the better. Ya 5 years of observing but not in the same location and have no reference of when the rain event happened. Even from orbit it took awhile to see the wet staining streaks....but the rover keeps moving so we may never see the changing event which may never be seen where it is going. I am glad he is saying reflective rock, but the top anomaly, no idea. 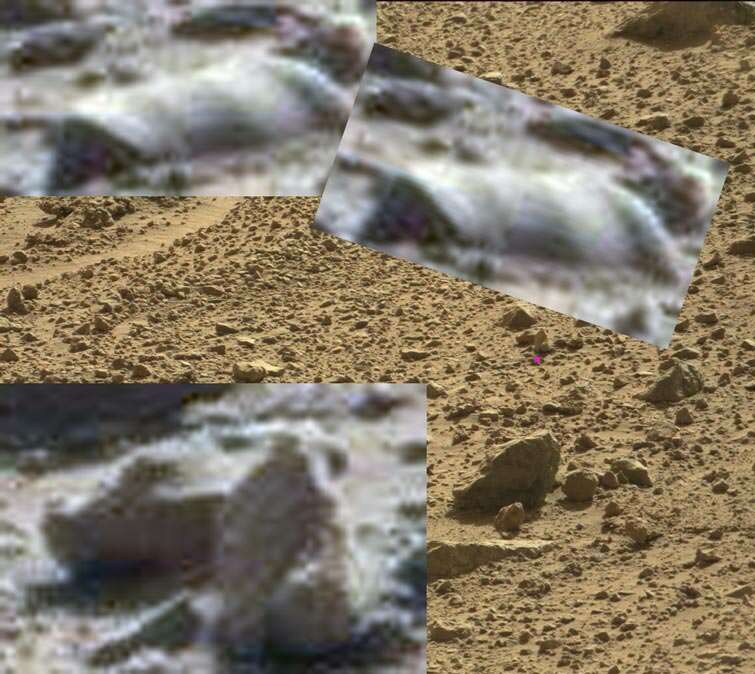 Agreed, and l have gone through about a years worth of rover images, with another 4 to go to catch up. But no reference points as to whether it was a downpour or light rain occurring over an hour or two, but l am going downpour, because of the water runoff. Top shows an area where the water pooled before sinking into the soil, which may suggest rabid rainfull for short periods. 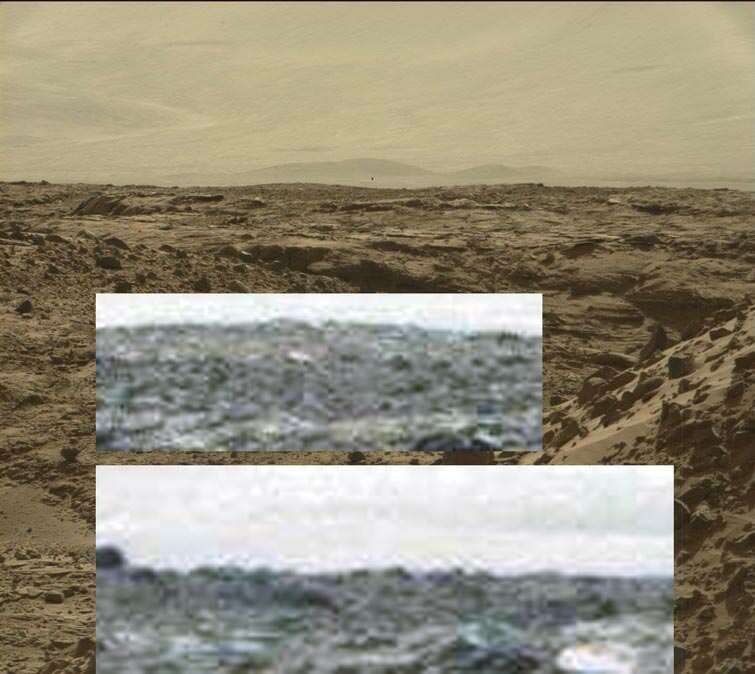 Ref, rock showing the rover, foreground and distant raincloud. Another anomaly is why NASA hardly ever comment on these anomalies unless they make the front page of the newspapers, in which case they get dismissed in one sentence with no detailed rebuttal. I think this is one of the most interesting anomalies to emerge this year, and can be added to several others that raise many questions. Yes, the water droplets on the rover should make the papers and newstations. 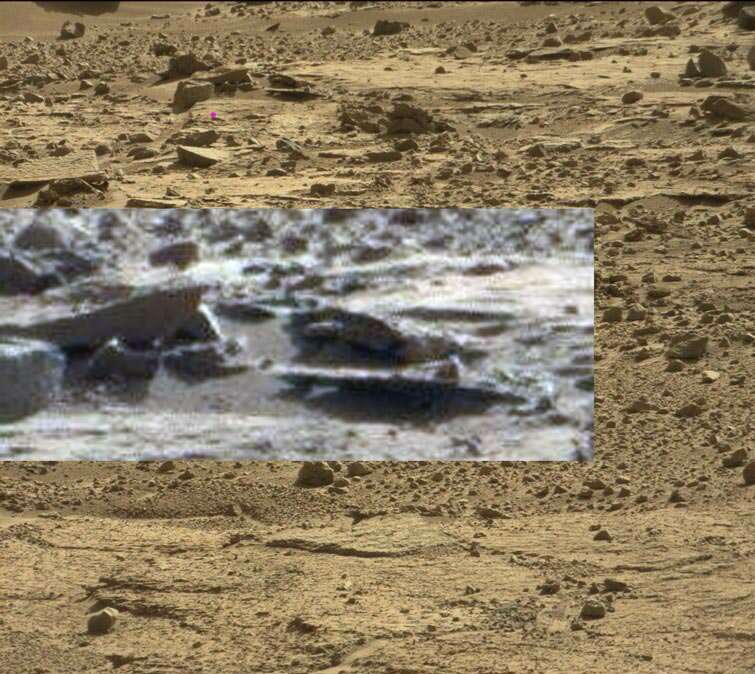 MARS HAS RAIN, or NASA ARE LYING, are the two most likely headlines that come to mind. But as you said, NASA dismiss, ignore, downplay or come up with some ridiculous, so called scientific reasons, why it isn't true. They will protect their interests, but also know with third party industries getting into space, their days of suppression, and feeding the sheep their daily bale of hay is limited. A nasty storm cloud in the distance, and most likely a torrential downpour on the right side. Ferns usually need regular downpours than light rain, so l will stay with the later until proven otherwise. I think the apparent dliapidated building structure at 1:23 is v. interesting. 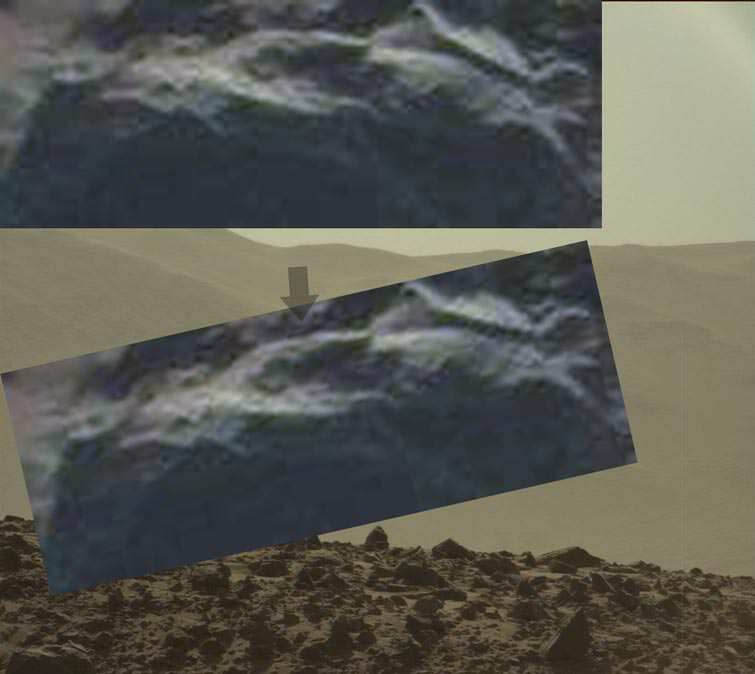 Yes, 1.23, l thought that it might be the rover, but the rover is the white part down the bottom of the ref, rock, so yeah, this seems to be a structure of some kind. It appears to also be partially transparent with support beams, and a shiny door, so unlikely to be a residential house, probably more of a crop growing setup? The sun is still setting, (the dark, rectangle is the rovers, robotic arm) and dark, clouds. 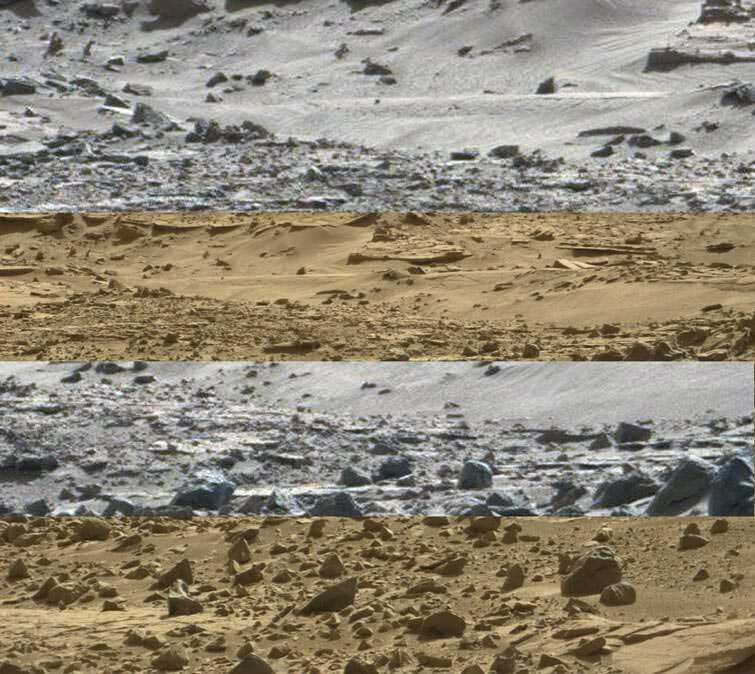 Purple/blue mountain, a river, reflecting what is left of the setting sun, surrounded by tree's, (CP the river and tree's with an obvious distinction between the two, the rover does not have the green color). Quick question though, do you know what that pink dot is? Just curious. Yep, the pink dot means that when l am tired, l need to put that in, so l don't have to do a double take trying to find it again. Been a few times when l found something interesting then could not find it again. Ok, usual today, puddles, truck, freeway. First off is the puddle, on this rock, and the rest of the area looks damp or wet. And this, what looks like a truck, noticeable flat area of ground, and further up, some flat, silver rings, (you are not going to put silver rings on a dirt road, or an old two lane, sealed road). Odd's on humanoids are one of the races living there at present. PS l will let you know when l go into the next Sol. Not easy to do as the two Cameras capture different aspect ratios. But well worth the effort. 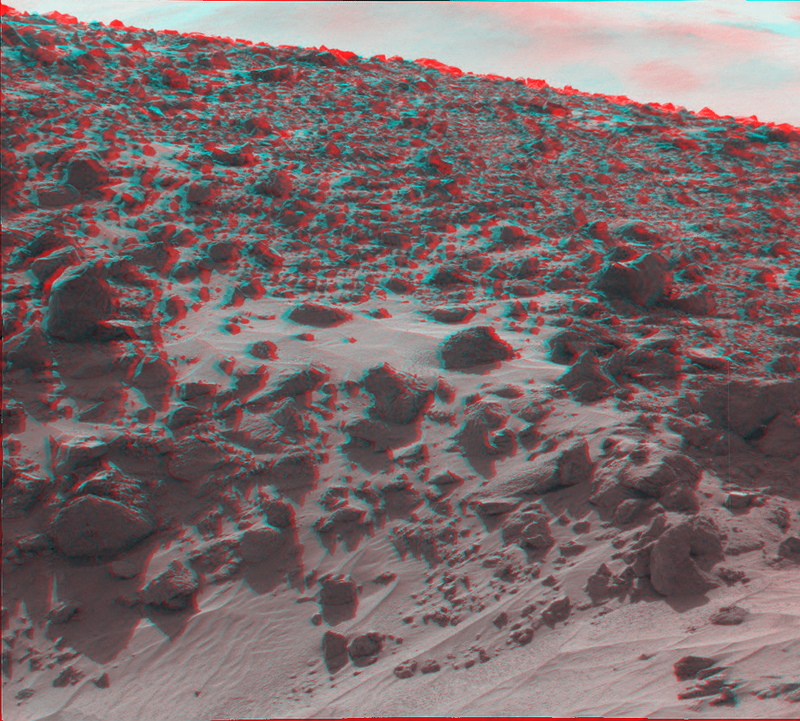 If you haven't got 3D red/cyan glasses yet, you don't know what you're missing! In the 2D image below, I used the Auto color corrector in Irfanview on both the top and lower half on this image file. 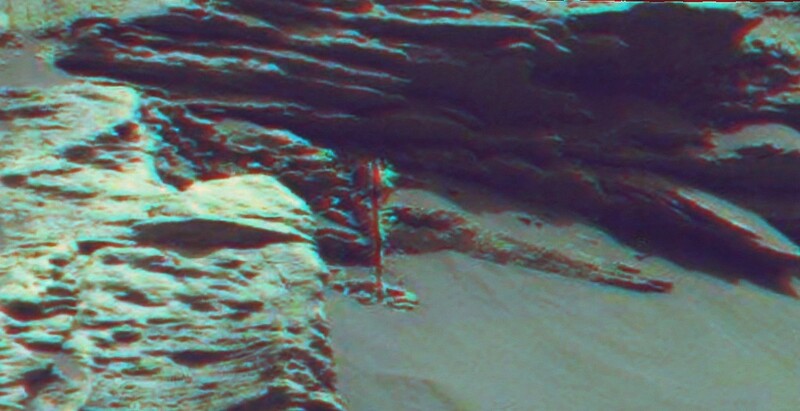 It does appear from the histogram, that there is many instances of green buried in the over saturated red image from NASA. I am no stranger to the western US deserts and clocked up hundreds of hours on a powerful Enduro machine in ALL seasons. The upper half to me, shows not only green lichen but considerable plant growth. Could humans (or anything else) survive on Lichen? There are records of lichens being used as food by many different human cultures across the world. 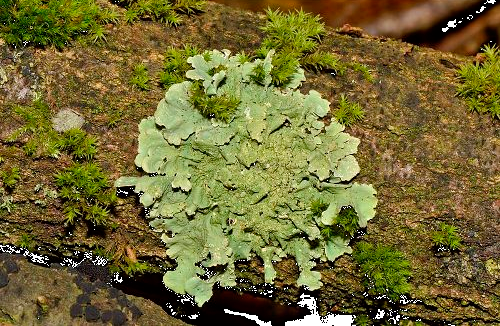 Lichens are eaten by people in North America, Europe, Asia, and Africa, and perhaps elsewhere. Often lichens are merely famine foods eaten in times of dire needs, but in some cultures lichens are a staple food or even a delicacy. Two problems often encountered with eating lichens is that they usually contain mildly toxic secondary compounds, and that lichen polysaccharides are generally indigestible to humans. Many human cultures have discovered preparation techniques to overcome these problems. Lichens are often thoroughly washed, boiled, or soaked in ash water to help remove secondary compounds. In the past Iceland moss (Cetraria islandica) was an important human food in northern Europe and Scandinavia, and was cooked in many different ways, such as bread, porridge, pudding, soup, or salad. Wila (Bryoria fremontii) was an important food in parts of North America, where it was usually pitcooked. It is even featured in a Secwepemc story. Reindeer lichen (Cladina spp.) is a staple food of reindeer and caribou in the Arctic. Northern peoples in North America and Siberia traditionally eat the partially digested lichen after they remove it from the rumen of caribou that have been killed. It is often called 'stomach icecream'. Rock tripe (Umbilicaria spp. and Lasalia spp.) is a lichen that has frequently been used as an emergency food in North America. One species of Umbilicaria, Iwa-take (U. esculenta), is used in a variety of traditional Korean and Japanese foods. It is quite expensive, and is collected off the sides of cliffs. In India, and other centers of curry powder production, garam masala sauce contains certain lichens used as bulking agents. Very few lichens are poisonous. Poisonous lichens include those high in vulpinic acid or usnic acid. Most (but not all) lichens that contain vulpinic acid are yellow, so any yellow lichen should be considered to be potentially poisonous. 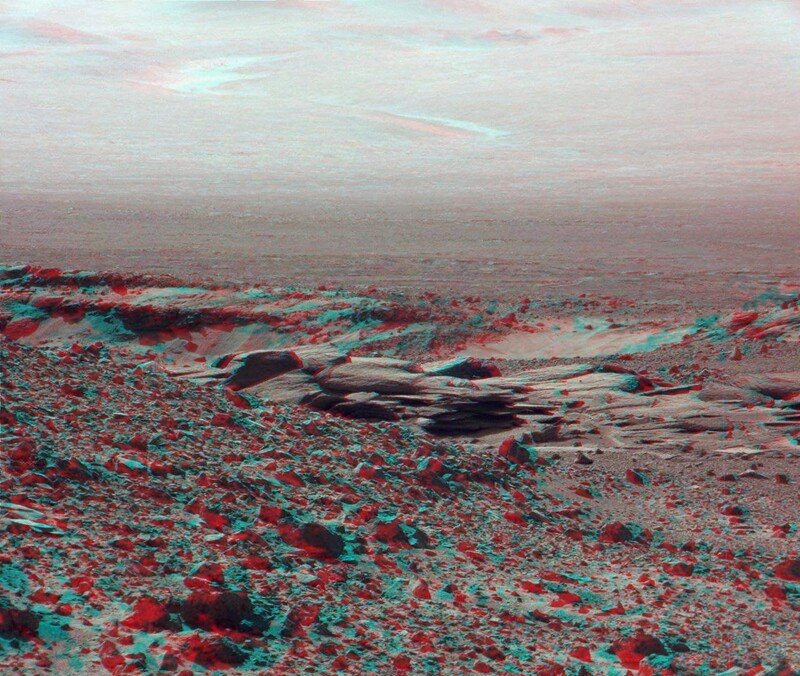 Nice one M-Albion-3D, and remember that this is the driest part of Mars or the equator, so if the rover landed in the greener areas, (as seen from satellite) then rain-forests would be the norm. With what l have so far seen, at least 70% of plant/animal life would be a carbon copy of ours, and maybe they have some species that are extinct here, with 30% being alien or new to us. 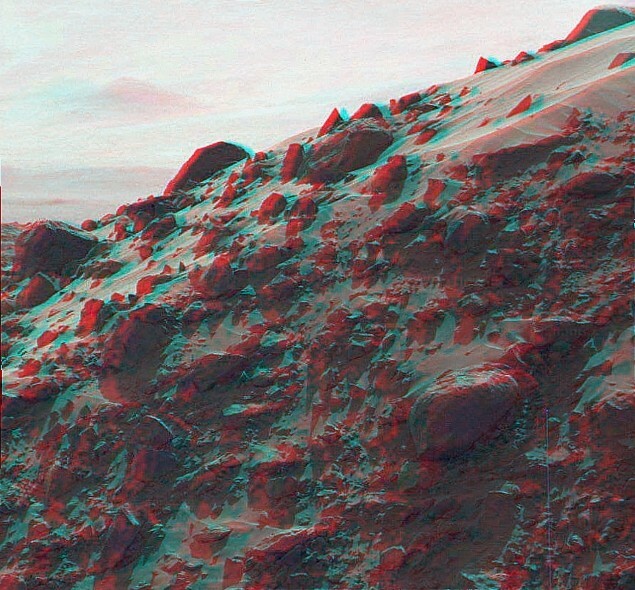 Another good example of a martian downpour. More good examples of torrential rain. This one in particular shows, a mini rapid flow in parts or there is quite a lot of water flowing. 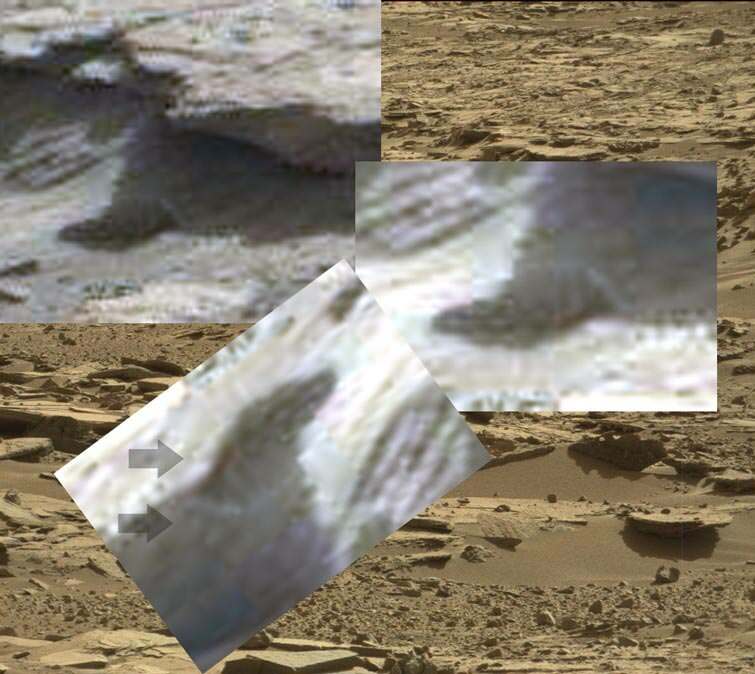 Lower images shows the water, mixing with the silt, (the right hand reflection gives that away) and all of this on a planet where pure or dirty water should be boiling away, lol. And the ground is bone dry, what a crock. Nothing much today rainclouds, tree's. 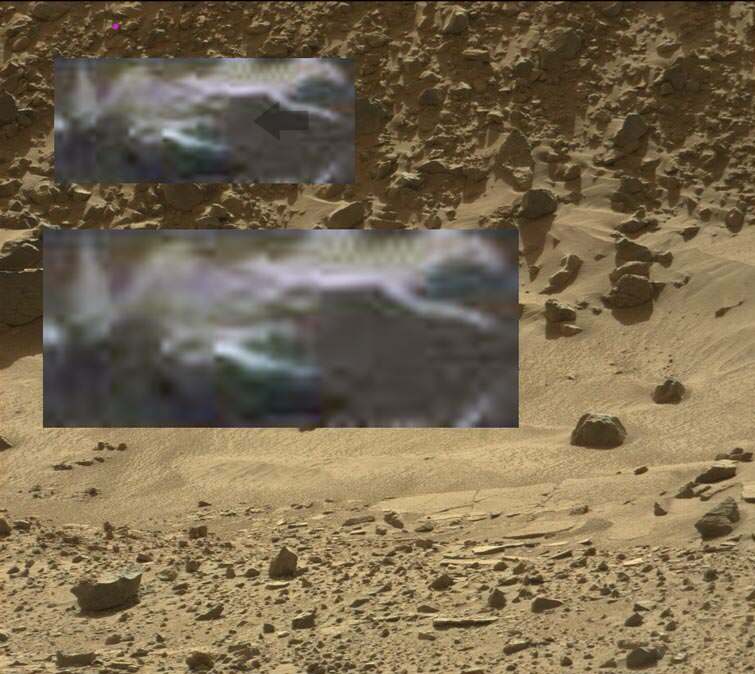 The right hand dark blob, and l believe the silver thing on the left are parts of the rover, but the mountains and rain clouds are not. 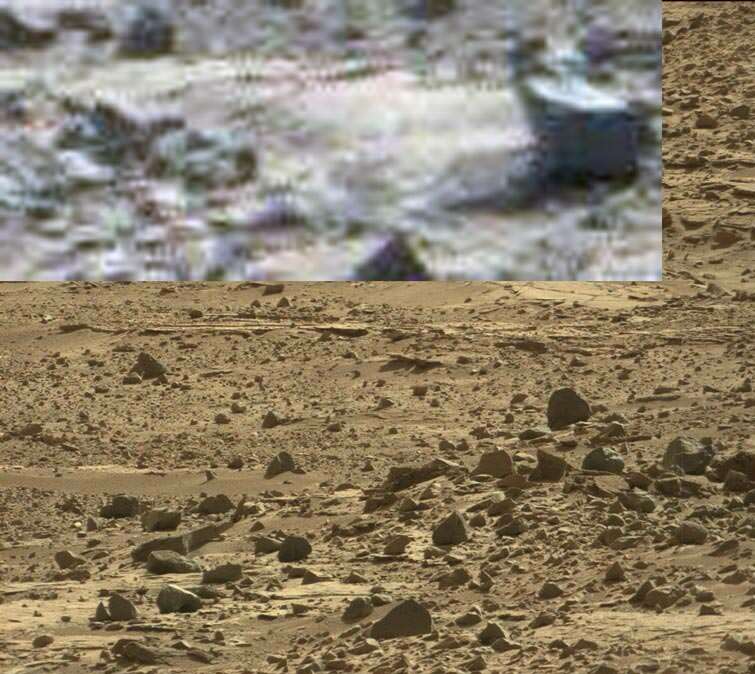 Things above martian tree's, (CP shows strong green) that look like pine tree's, and the thing below a plant. With a whitesh blurr inbetween us and the mountains, which is either light rain or mist, (probably light rain). Not much today, water puddle. 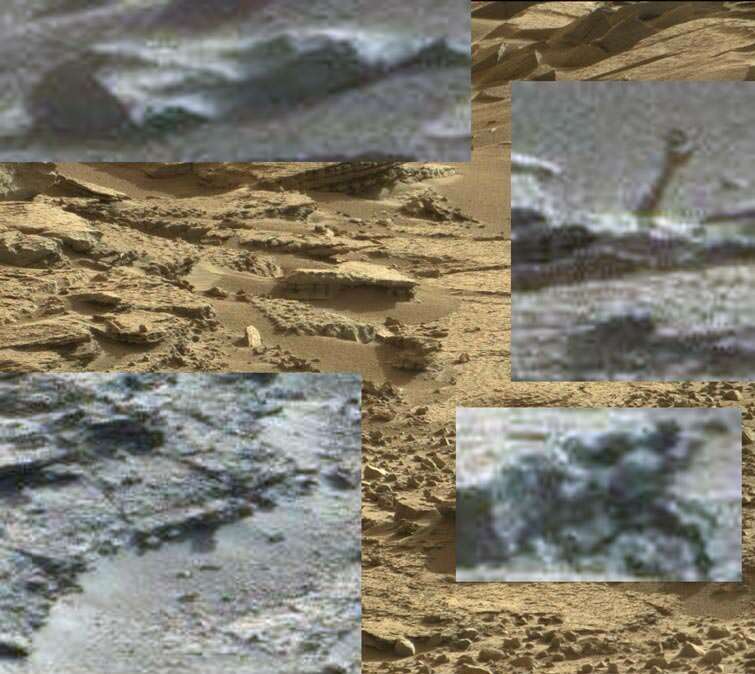 A good example of fiddling, by JPL. First off l noticed that the shadow showed this sculpture, plant or whatever, but the object wasn't visible, on the edge of the rock? 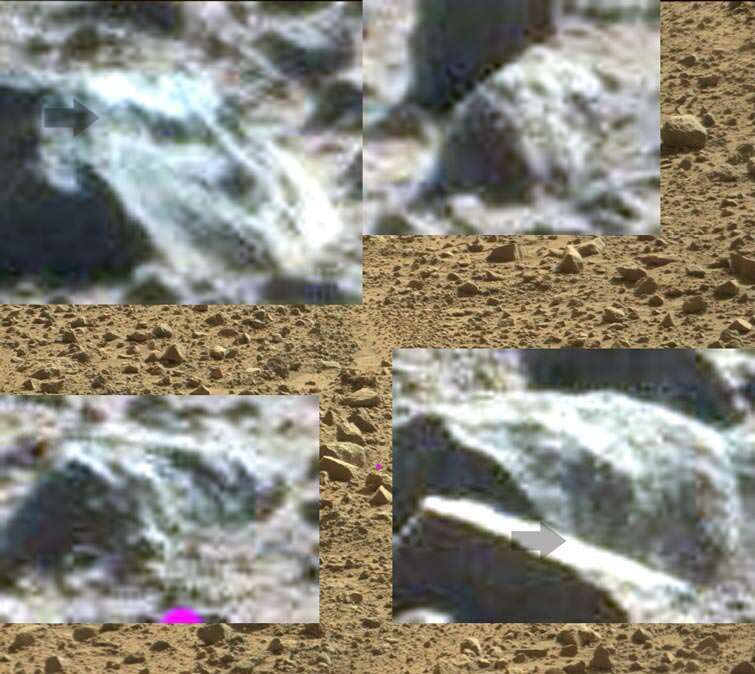 The lower image that l reversed and pushed the contrast and brightness with, shows a plant or sculpture sitting on a slab of concrete. But if you look more closely it is actually sitting on a box, with a pattern of circles on two of its sides. 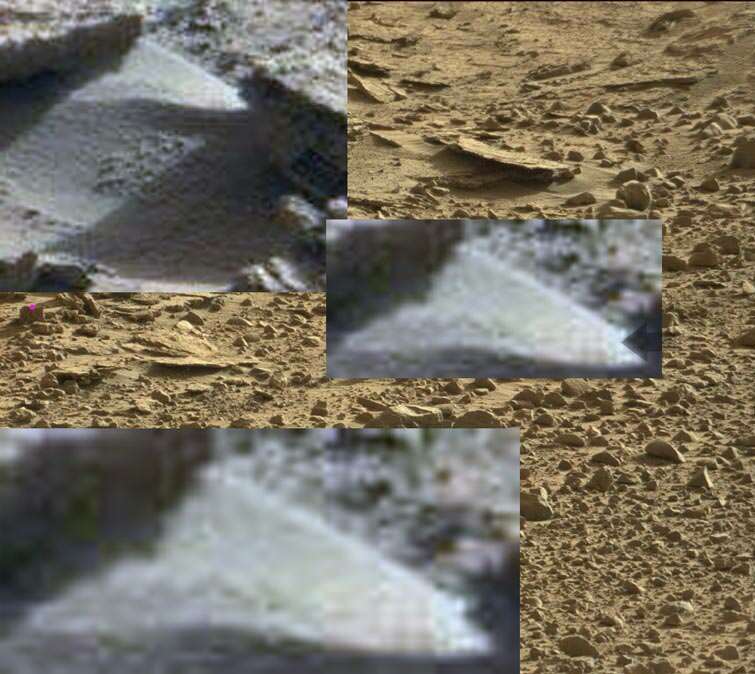 Beats me what this is, but it is clear that NASA photoshopped it from the top of the rock, where it originally was, reversed and darkened it and tried to make it the shadow. Glad l don't work there. Top/left arrow shows some tree's against the mountain. And the lower/right probably shows a closeup of one. 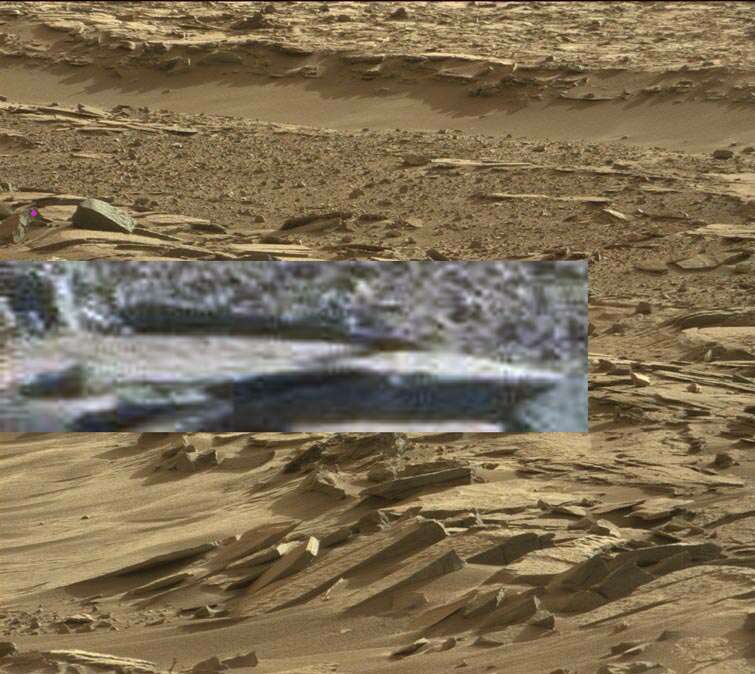 And this, alien storing rocks under this flat one, who knows. The sun is still setting, the slightly orange sun that isn't supposed to be there, inbetween the overcast sky that is impossible, lol. Next image the sky, that looks no different to an Earth sky, with mist probably coming in off the lake, or low lying areas. Either way it obviously gets cold when the sun sets, (not the -200 dc crap NASA gives us). And this, top misty landscape. 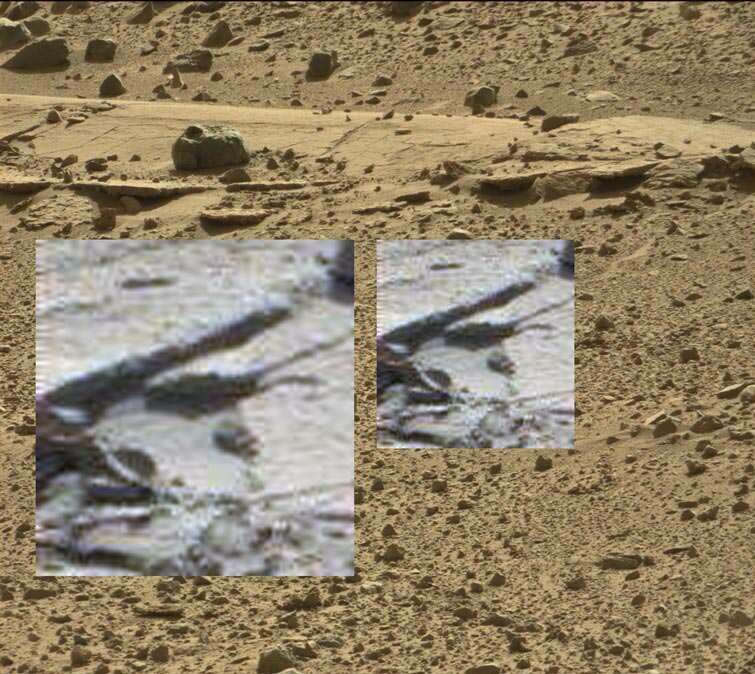 Right hand one, a plant that obviously has been edited by JPL staff. 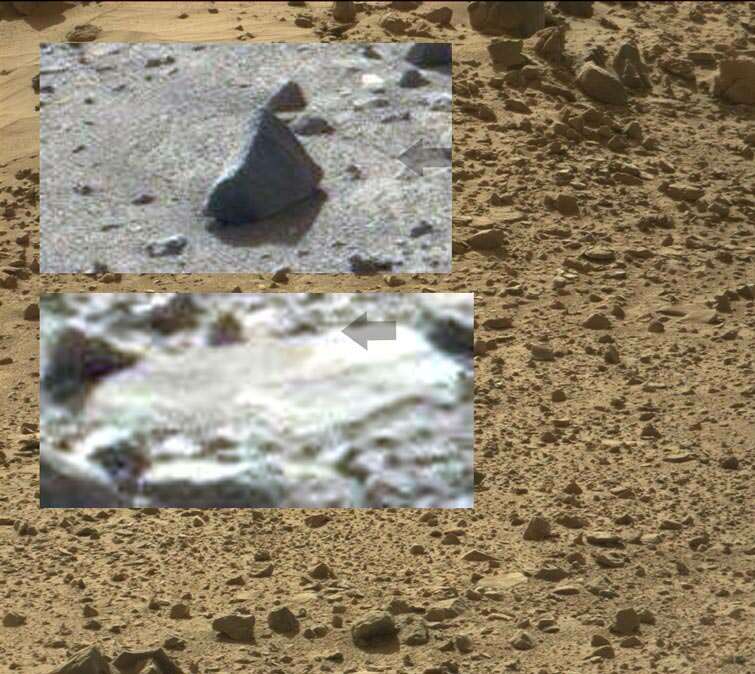 One below that a plant that got away with it since it is shown in a ref, rock. And the lower one, wet, muddy ground with good signs of runoff of the ground higher up. Least we have another option if we trash the Earth too much, although the martians may not be crazy about a few billion of us, taking up residence there. "A tree grows in Brooklyn"
Nice one, Albion, it certainly looks like a plant. Ok the usual today, blue mountains in the distance, overcast clouds in the sky, green vegetation, and maybe some distant tree's. Seriously looks like a distant city, or industrial complex, (doesn't match the rover at all)? Very interesting find! Was that your own discovery? Certainly needs wider exposure.